Motorists planning journeys into or through France this summer to ensure they check the expiry date of the breathalysers that they are carrying in order to remain on the right side of the law, advises Halfords. 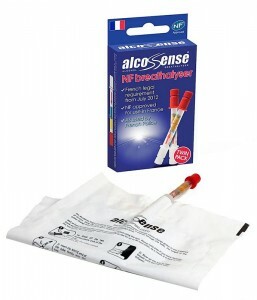 Carrying an NF approved breathalyser (NF=French Standard, which is their equivalent of our British Standard) has been a mandatory legal requirement in France since 1 July 2012. Howe ver, many motorists are unaware that these disposable breathalysers have an expiry date. Halfords product manager David Hammond explains: “With around a fifth of drink drive accidents happening the morning after, these handy devices will advise you whether you are safe to drive by showing you your blood alcohol level within 2 minutes. All batches of the NF breathalysers have an expiry date printed on the base of the cardboard packet, as well as the NF logo, which makes checking that they comply with the law a simple task. Halfords only recommends driving with 0% alcohol in your blood and these highly accurate NF units are potential lifesavers – measuring to 0.5% BAC (Blood Alcohol Content) they are the same type used by the French police. David Hammond added: “Once you have confirmed that your breathalysers have not expired, or replaced them if they have, do bear in mind that the French Authorities recommended carrying two. That way if one is used the driver will still have a spare and both must be easily accessible in order to comply with the letter of the law.